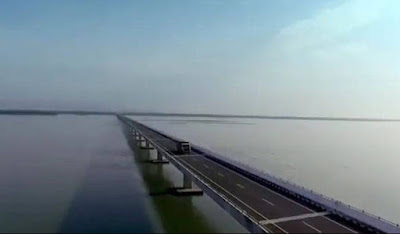 India's longest bridge, to open in Assam today. Bringing Assam and Arunachal Pradesh closer, the country's longest river bridge - the Dhola-Sadiya - constructed over the mighty Brahmaputra, is all set to be inaugurated by Prime Minister Narendra Modi on Friday. Here's all you need to know about the bridge that's touted to transform road connectivity in the northeastern region. 1. The new, three lane, 9.15 kilometre Dhola-Sadiya bridge has been built over river Lohit, a tributary of the Brahmaputra, and links Dhola in Assam to Sadiya in Arunachal Pradesh. 2. Earlier, the only means to cross the Brahmaputra at this location was by ferry in the daytime, and even this was not possible during floods. The Dhola- Sadiya bridge will ensure 24X7 connectivity between upper Assam and the eastern part of Arunachal Pradesh. 3. The bridge will also reduce the distance from Rupai on NH-37 in Assam to Meka/Roing on NH-52 in Arunachal Pradesh by 165 KM, cutting down on travel time from the current six hours to just one hour. 4. This, the government claims, will result in saving of petrol and diesel worth Rs 10 lakh per day. 5. Given the fact that the North East is prone to high seismic activity, the bridge has been provided seismic buffers in all its 182 piers. 6. The total length of the Dhola-Sadiya bridge project, including the approach roads on each side, is 28.50 km. The length of the bridge itself is 9.15 km. 7. Constructed at a total cost of Rs 2,056 crore, the bridge is part of the Arunachal Package of Roads and Highways under the Ministry's Special Accelerated Road Develoopment Programme for North East. 8. The Dhola-Sadiya bridge promises to provide efficient road connectivity to remote and backward areas which have poor road infrastructure, which will give a major boost to overall economic development of the areas north of the Brahmaputra in upper Assam and Arunachal Pradesh. 9. The bridge will also benefit the army, with convoys requiring less time to journey from Assam to the posts along the India-China border in Arunachal Pradesh. The bridge is also expected to enhance India's defence capabilities in the northeastern region. 10. The government said it will also facilitate numerous hydro power projects coming up in the state, as it is the most sought-after route for various power project developers.